Born in 1891, in the spa town of Druskininkai in present-day Lithuania, Jacques Lipchitz was the son of French-American parents. He studied in Vilna (now Vilnius) from 1906, moving to Paris in 1909, where he became a pupil at the École des Beaux-Arts and the Académie Julian. In Paris, he met Soutine, Modigliani, Rivera and Picasso, and was inspired to produce the first cubist sculptures, a style he pursued from 1913. In 1920 he had his first solo exhibition at the gallery of the dealer Léonce Rosenberg. The first retrospective of Lipchitz's work took place at the Galerie de la Renaissance in 1930. In the following years, Lipchitz's work developed in an unconstrained, increasingly organic style. He produced the monumental Prometheus for the 1937 Paris World Exhibition, for which he was awarded a gold medal. In 1940, Lipchitz fled occupied Paris for Toulouse, before departing for the USA, where he settled in New York. There, his work was soon regularly shown at the Buchholz Gallery (later the Curt Valentin Gallery). In 1947 he moved to Hastings-on-Hudson in New York State. In later life, he exhibited widely in America, with retrospectives in New York and Minneaopolis in 1954. 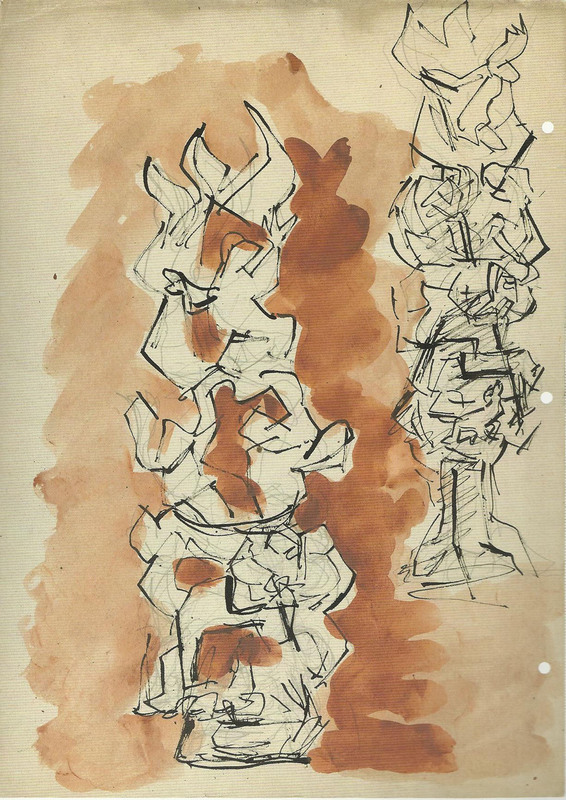 Lipchitz took part in Documenta in Kassel, Germany, twice in 1959 and 1964. Lipchitz's second wife Yulla came from an orthodox Jewish background, inspiring his later interest in the political fate of Israel and the conventions of Jewish orthodoxy. From 1962, he received numerous important public commissions in the USA and Israel. Lipchitz died on holiday in Capri in 1973, and was buried in Israel. Lipchitz completed two variations of the theme of 'Between Heaven and Earth' between 1967 and 1969, which he produced for the Nelson-Atkins Museum in Kansas City and the Los Angeles County Music Center. The 'Study for Between Heaven and Earth' comes from a later period of exploration of this theme.